The biggest mistakes I've made with my wedding photography business...and how to get people to NOT take you seriously. Early last year after my twin Carly graduated from college, I convinced her to relocate to Los Angeles and live with me in my tiny one-room studio apartment so she could be my right-hand woman in the wedding photography business I sought out to start. Sure, I'll be the first to admit it was a completely selfish move of me since it didn’t matter that Carly wasn’t all that interested in shooting long 10-hour weddings for a living. This was MY dream and somehow I convinced her it should be hers, too. It played out perfectly in my head: two energetic, young, and artsy sisters breaking out as the new industry stars seemingly out of nowhere. I already had the equipment, Photoshop know-how, blogging clout...things looked so promising that there was no way this wouldn't work, right? 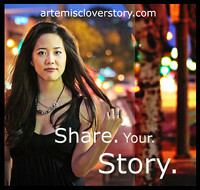 By April, Artemis Clover Photo was ready to open doors for business and take the greater L.A. area by storm. 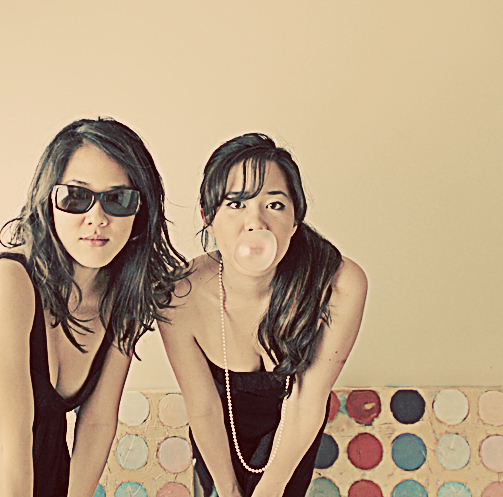 Completely misguided, our first marketing campaign included pictures of us looking like underage coeds straight out of the Bangkok edition of Maxim. 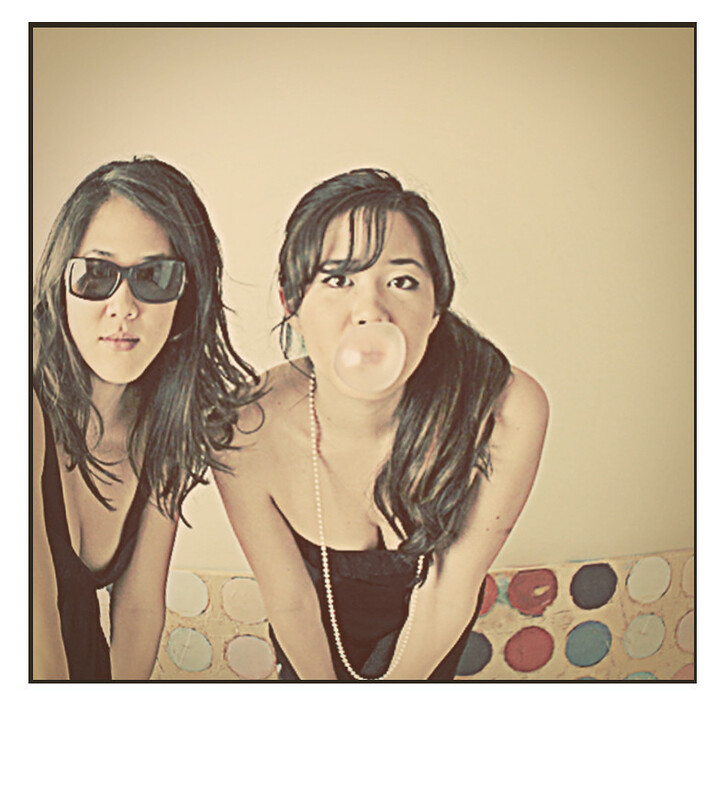 And the bubblegum...really?? People did take notice and we were booking paid gigs but 1.5 years, four corporate jobs, and a baby later, I think it is safe to say we are officially closing this chapter of my life. ACP wasn’t the smashing success I had hoped for and I never made much money doing it but it was a good first effort towards temporarily satisfying my entrepreneurial spirit. We all need that one (or two or three) “failed” business under our belts to truly know what it takes and means to work for yourself (not that anyone will ever have all the answers). And looking back I can say it was a way more entertaining avenue of learning the hard-knocks of business and marketing than any economics class with Mrs. Thompson (shudders just thinking of her) could ever provide. The SOOC shot was taken with a self-timer in our teensy kitchen. So what were some of the mistakes (and oh were there PLENTY!) we made? 1. Not charging what we were worth or worse, doing things for free: This is one of those flip-flopped and backwards things in life where the less your brides pay you, the more demanding they are and the less they respect you and your work. I knew what level of service and product I was able to and did provide to my clients but because I didn’t think people would actually pay me what I thought I was worth, I held my prices very low to attract clients. But the ironic thing is it led to people not trusting my artistic vision and professionalism as a photographer because when they’re not paying you much for your services, they don’t know your true value and level of expertise. 2. Apologizing too much or feeling the need to always add a disclaimer: Because we were just starting out and because we were so young, I was constantly putting our business down in my blog and in my interactions with clients and fellow photographers or making sure people knew that we were new to this whole wedding photography business. I guess I subconsciously did that because I was afraid people might actually—gasp—take us seriously and therefore expect us to know exactly what we were doing. It takes business owners years and years and many missteps before they can even have a semblance of confidence in their actions and decisions and everyone has to start somewhere so no one expects you to magically know all the right things to do right away. Being honest about being new to the game is one thing but being overly honest so you don’t have to take responsibility for your slip-ups is just shooting yourself in the foot. 3. Lack of focus or making it hard for people to know exactly who I am and what I am doing: It’s called transparency, folks, and every good business needs to be crystal clear. Your prospects need to know exactly what you can offer them and why you will do it better than everyone else. And they need to know that right away without having to do a lot of sleuthing and investigating on your business websites and blogs to figure out what you are all about. Artemis Clover Photo was neither here nor there (again probably because I was afraid to take ownership that yes, I am a REAL photographer) and I quickly learned that just being semi-cute and flirty ain’t good enough for people to shell over money to ya (unless you are in, uh, a different line of business). 5. Expect to fail many times, you will have naysayers, and you’re going to make some costly mistakes: People don’t have successful businesses because they’ve encountered the least resistance. They do well and continue to advance and innovate because they persevere and have already made room for mistakes in their business plan. You need some grit and toughness in business and maybe I just didn’t have enough fire to keep pushing through the challenges that appeared along the way. I immediately cropped this photo since I know Carly will think her arms are fat otherwise. Because I am feeling tacky today, I adjusted the highlights/shadow of this picture to give it a cartoonish feel. I ran an action to make this photo look "aged." I distorted the picture to make it look like I used a wide-angle lens, lightened everything up, and adjusted the canvas to resemble a Polaroid snapshot. Viola! A picture so wrong in all the right ways. What can you add to the list? And following my baby story? Next installment is coming tomorrow tomorrow night! I am excited for your next installment! I have to agree with the less the pay, the more they demand. I did my brother's wedding for free and they were the most demanding couple I have ever worked with. Every time she would call and demand something else, I would get frustrated. It got to the point where I had to tell her I needed to meet the needs of my paid clients first. In my experience, it is my family that is most demanding on me. They want free photo shoots. The first question they ask me is if I am coming to an certain event and the next is if I am bringing my camera. Frustrating. yes if you are serious about being a paid photographer, you have to set very clear boundaries of when it is business and when it is personal. people can't just expect you to be there to photograph stuff anymore if you are trying to make money from it and this was something i struggled with too for friends. good luck! A problem that many people don't think of is having your business outgrow you. If you aren't careful, you can end up like I did and work for 4 straight month with ZERO days off. You might get better eventually and decide to take 1 whole day off every 4-6 weeks. But you have to start out with a plan about time off - even if you don't think you should be worrying about it at the onset. Business owners should own the business, not let the business own them. I 100% agree with all of your other points too! All good points...and part of the reason I don't want to be a wedding photographer. Heck, I'm kinda resistant to being a portrait photographer. Have a great weekend! This was so dead on. Loved it. Very great advice. I love that picture with your sister. So fun! it's always good to look back and re-access what worked and what didn't. i will be obsessively checking back today until you get the next king story up. Some great advice in there - particularly number 2. I think that could be applied to any form of employment. Thanks for sharing!